I first came across this delightful little piece, attributed to “the circle of Sebastian Stoskopff” (1597–1657), on the web, quite by accident. It’s become a favorite. 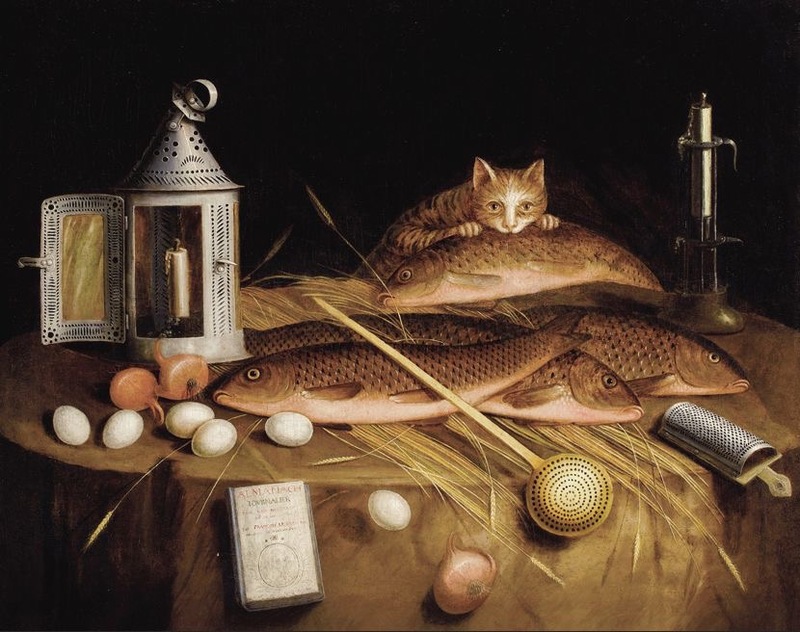 Okay, the cat is cute, but it’s observed in a very even-handed manner along with the fish, the hay, the lantern, and everything else. What we have is a collection of objects of which the cat is one, rather than an adorable anecdote in which the cat is the star. Everything is presented with a rather flat, obvious touch rather than the overcharged, highlight-glinting style so common in genre pieces of fish and attendant animals. The different objects are on a visual par with each other. Even the book, egg, and onion, which appear to be falling off the table, are so undramatic that the eye reads them as needful and enlivening detail rather than incident.